New Delhi, March 22: Former Indian cricketer Gautam Gambhir joined the Bharatiya Janata Party (BJP) on Friday, March 22, in the presence of Finance Minister Arun Jaitley. Reports that Gautam Gambhir would join politics started doing rounds ever since the cricketer announced retirement from all forms of cricket on December 4, 2018. With his decision to join the BJP, Gambhir becomes the latest cricketer to take the political plunge. Gautam Gambhir Joins BJP Ahead Of Lok Sabha Elections 2019, Says 'I've Been Inspired by PM Narendra Modi'. The likes of Navjot Singh Sidhu, Kirti Azad, Mohammad Azharuddin and Mohammad Kaif are cricketers who are already active in politics. Here is a brief look at the journey of these cricketers who joined politics and which party they belong to. Former cricketer Navjot Singh Sidhu joined the BJP and was given a ticket from Amritsar seat in the 2004 General Elections. Sidhu won the seat and continued to be an MP in the Lok Sabha, before he was nominated to the Rajya Sabha. However, Sidhu resigned from the BJP and Rajya Sabha and joined the Congress in 2017. He is currently the member of legislative assembly (MLA) from Amritsar East seat. Navjot Singh Sidhu Gets Positive Response From Imran Khan, Pakistan to Not Build Structures Near Kartarpur Sahib Gurudwara. Kirti Azad was part of the 1983 World Cup winning team and is the son of former chief minister of Bihar, Bhagwat Jha Azad. Though Kirti Azad's father was a veteran Congress leader, Kirti decided to join the BJP and won from the Darbhanga seat. However, Kirti Azad was expelled from the BJP in the year 2015 after he levelled corruption charges on Arun Jaitley run DDCA. Kirti Azad joined the Congress party in 2019 in presence of party president Rahul Gandhi and is the sitting MP from Darbhanga seat. Lok Sabha Elections 2019: Suspended BJP MP Kirti Azad Joins Congress in Bihar, Likely to Contest From Darbhanga. Currently holding the position of working president of Telangana Pradesh Congress Committee, Mohammad Azharuddin joined the Indian National Congress party on 19 February 2009. He was also elected the MP from Moradabad in Uttar Pradesh. Former cricketer Mohammad Kaif joined the Congress party in the year 2009 and contested from Phulpur constituency, Uttar Pradesh. However, he lost from the seat and could not be successful like other cricketers. As the 2019 Lok Sabha elections draw nearer, there are reports of other cricketers joining politics too. 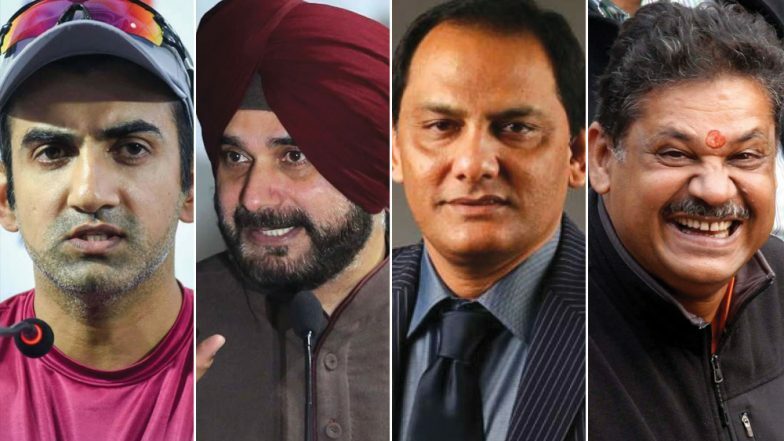 A few weeks ago, reports said that the BJP is approaching cricketers Harbhajan Singh and Virender Sehwag to be a BJP candidate for the 2019 Lok Sabha Elections. However, it remains to be seen if they will follow Gautam Gambhir as well.